SEATTLE--(BUSINESS WIRE)--(NASDAQ:AMZN)—Amazon today announced Alexa for Hospitality, a new experience offered by invitation to hoteliers that brings the simplicity and convenience of Alexa to hotels, vacation rentals, and other hospitality locations. 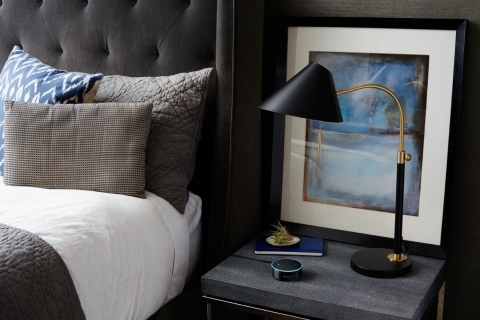 Using the Amazon Echo in their room, guests can now ask Alexa for hotel information, contact the hotel to request guest services, play music in their room and more. For hotels, Alexa for Hospitality helps deepen guest engagement through seamless voice-first experiences that offer new ways for guests to access services and amenities during their stay. Alexa for Hospitality is available to hospitality providers by invitation starting today, with Marriott International introducing the new Alexa experience at select properties in Marriott Hotels, Westin Hotels & Resorts, St. Regis Hotels & Resorts, Aloft Hotels, and Autograph Collection Hotels starting this summer. Amazon helps hospitality providers offer new, engaging guest experiences with Alexa for Hospitality.